An Ontario court has upheld the dismissal of a Costco employee who was fired after failing to provide a truthful explanation regarding the filing of health benefit claims for a daughter she didn’t have. Mykki Cavic was a night floor merchandise supervisor for Costco Wholesale Canada for about 19 years. In 2004, Cavic noticed a “phantom dependent” erroneously listed on her benefits profile as her daughter. Cavic contacted the insurance provider on multiple occasions in an attempt to have the phantom dependant removed. However, her efforts were unsuccessful. Six years later, in 2010, Cavic attempted to call the insurance provider’s attention to the problem by falsifying documents and submitting false claims under the phantom dependant’s name, for which she received reimbursements. However, when the insurance provider contacted Cavic after she submitted the falsified claims and inquired if the phantom dependant was her daughter, Cavic confirmed that she was. Though she successfully obtained the insurance provider’s attention as originally desired, Cavic failed to proceed with the removal of the name from her benefits profile. When Costco discovered Cavic’s actions, it provided Cavic with two opportunities — in addition to that provided by the insurance provider — to provide a reasonable explanation for her actions. In Costco’s opinion, Cavic’s explanation was not reasonable. Costco considered Cavic’s conduct to be an attempt to gain a greater amount of reimbursement then what was permitted under the benefit policy. Additionally, it found her conduct to be a fundamental breach of trust given Cavic’s management position, which entailed significant trust and reliance. Costco terminated Cavic’s employment for cause. After hearing evidence from both parties, the court determined Cavic’s explanation for submitting the falsified claims was not credible and her conduct constituted cause for termination. It dismissed Cavic’s claim for wrongful dismissal. 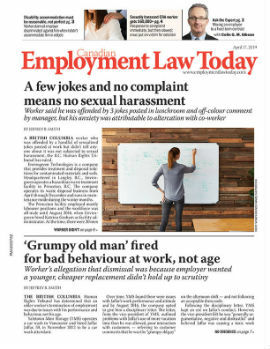 Generally, terminations for cause can be difficult for employers to justify unless the employee’s conduct in the given situation has fundamentally breached the employment relationship beyond repair. As demonstrated above, one of the ways in which a fundamental breach will be found to have occurred is when the employee engages in conduct which breaches the trust or reliance an employer has placed in her. Employers who terminated someone for cause must be prepared to justify the termination and meet the high threshold for just cause. Given the difficulty that is generally associated with justifying a termination for cause, employers should be aware of this decision, which demonstrates that an employee whose conduct fundamentally breaches the trust and or reliance placed in them by the employer will be justified in terminating the employee for cause. However, given the court will consider the specific context of each termination for cause to determine whether or not it is justified, employers should have documentation — and legal advice — to back them up. • Cavic v. Costco Wholesale Canada Ltd., 2012 CarswellOnt 13359 (Ont. S.C.J.). Ronald S. Minken is a senior lawyer and mediator at Minken Employment Lawyers, an employment law boutique in Markham, Ont. He can be contacted by visiting www.MinkenEmploymentLawyers.ca. Ronald gratefully acknowledges Sara Kauder and Kyle Burgis for their assistance in this article.